Studying the effects of drugs on the metabolome constitutes a huge part of the metabolomics discipline. Whether the approach is associated with drug discovery (altered pathways due to the disease that provide future targets and information into the mechanism of action or resistance, etc.) or pharmacometabolomics (studying the outcome of treatment), there have been many aspiring published articles in this area. With specific experimental design, including fingerprinting analysis with different analytical platforms in a non-targeted way, the approach is advancing towards the discovery of markers for the implication of personalised medicine, while also providing information that could help to improve the efficacy and reduce the side effects associated with a treatment. In this review, the evolution of pharmacometabolomics from other areas of drug efficacy metabolomics studies is explored. Keywords: Biomarker, Drug discovery and development, Metabolomics, Personalised medicine, Pharmacometabolomics. Keywords:Biomarker, Drug discovery and development, Metabolomics, Personalised medicine, Pharmacometabolomics. Abstract:Studying the effects of drugs on the metabolome constitutes a huge part of the metabolomics discipline. Whether the approach is associated with drug discovery (altered pathways due to the disease that provide future targets and information into the mechanism of action or resistance, etc.) or pharmacometabolomics (studying the outcome of treatment), there have been many aspiring published articles in this area. With specific experimental design, including fingerprinting analysis with different analytical platforms in a non-targeted way, the approach is advancing towards the discovery of markers for the implication of personalised medicine, while also providing information that could help to improve the efficacy and reduce the side effects associated with a treatment. 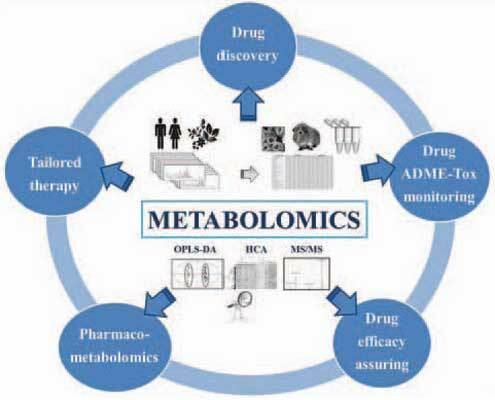 In this review, the evolution of pharmacometabolomics from other areas of drug efficacy metabolomics studies is explored.